Comments Off on #Ticks. Avoid Them. Remove Them. Here’s How. #Ticks. Avoid Them. Remove Them. Here’s How. 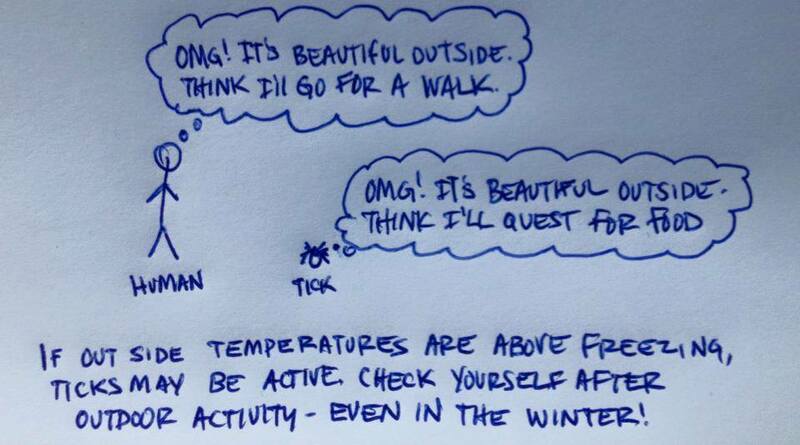 Winter weather doesn’t mean time to stop thinking about ticks. Certainly not for the Don’t Get Ticked New York team here at the NYSIPM program. Tick are active year round, and are out looking for hosts We’ve continued to provide resources and give talks around the state, and update our own resources. Visit the Don’t Get Ticked New York page. Watch this video by Joellen Lampman and share this post! Ticks and tick-borne diseases have become a significant public health issue in New York, with different tick species and diseases currently present and spreading within the state and region.Visit the Don’t Get Ticked New York page. The goal is to prevent ticks from becoming embedded in the first place. But if you do find an embedded tick, remove it properly! And in the springtime the blacklegged tick nymph turns to thoughts of questing. And nymphs are small. Poppy seed-sized small. If you are not intentionally conducting a daily tick check, you could easily miss one. And even if you are intentionally looking, one can occasionally get through your visual defenses. 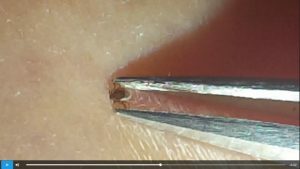 Which is why I was able to take this tick removal video after finding this tiny nymph on my leg when using my fingertips to search by feel. Since Powassan virus can be transmitted after 15 minutes of the tick being embedded, the incentive for not being bitten has risen dramatically. Which brings us to the use of clothing treatments to protect ourselves. Permethrin is a pesticide that can be applied to clothing, footwear and gear before exposure. Researchers for the Center for Disease Control recently conducted a study showing how permethrin interferes with blacklegged, American dog, and lone star ticks’ ability to move and, thus, to bite. Read about it here. Now the easiest option is to buy pretreated clothing or have your clothes professionally treated. The TickEncounter Resource Center has an excellent section of their website about tick repellent clothes, including where to get them. The label is the law and will tell you everything you need to know about using a pesticide correctly and legally. Signal Word – this is your clue to how dangerous the pesticide is. To put it simply, categories include Caution (slightly toxic), Warning (moderately toxic), and Danger (highly toxic). 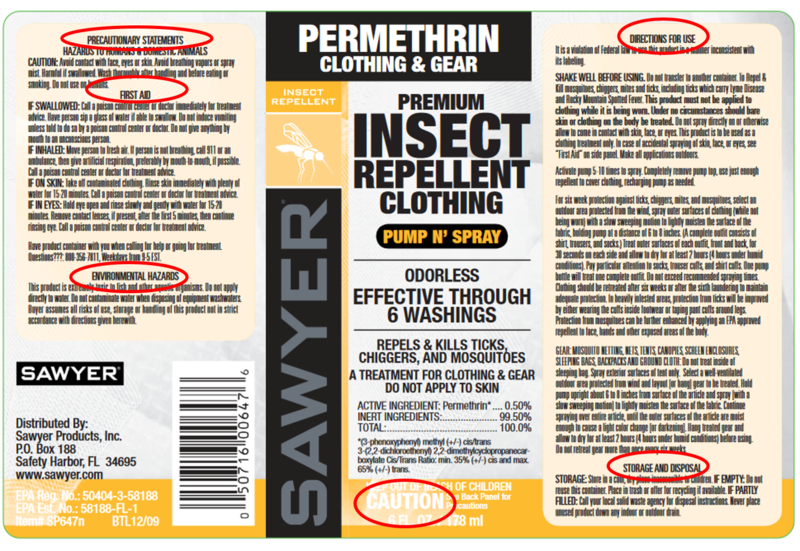 This formulation of permethrin is labeled Caution. Store in a cool, dry place inaccessible to children. FIRST AID – in case you didn’t follow the precautionary statements. This product is extremely toxic to fish and other aquatic organisms. Then plan for the next application. “Clothing should be retreated after six weeks or after the sixth laundering to maintain adequate protection” I both mark the day I sprayed in my calendar and schedule an appointment for six weeks later. By the way, professionally treated clothing also has a label, often found on the hang tag when purchased. Be sure to follow those instructions carefully as well. For more information about permethrin, visit the National Pesticide Information Center and EPA. And for more information on ticks, tick-borne diseases, why there are so many of them, and how to protect yourself, check out our new improved tick page – www.dontgettickedny.org.